Eyebrights - the Genus Euphrasia - have a reputation for being difficult to identify. The reputation is well-deserved! And the north coast of Scotland is a place where several rare and special species grow. This makes for an important headache for the northern botanist. Here I summarise features of the species which are known from the north. The general "look" of an eyebright (see Fig 1) is readily recognised. It is an annual plant with a single stem rising from the soil then rising with many or no branches and with many leaves directly attached to the stem . The flowers develop in the axils of the leaves and eventually turn into seed capsules. The white/purple flowers have a lower lip which has a yellow blotch and deep purple lines. The upper lip hoods over the flower and there are two side lobes. After that general description it becomes difficult to differentiate into species, yet individuals are so different that they can hardly be described as being of the same species. Some authors solve this by calling them microspecies, but recent authors have settled on just calling them species. All are semi-parasitic, being able to sustain themselves independently but normally invading the roots of (usually) grasses to get extra sustenance. One big problem is that they readily hybridise, so one often encounters mixed populations of hybrids which cannot be identified except by finding the pure parents somewhere in the locality. In this account I have used two referenced authors. In 1978 Peter Yeo produced a major revision of the eyebrights of Europe, dividing them into 48 species. He was very familiar with the eyebrights of the north coast and dealt with the area soundly. In 2009 Peter Sell revised the eyebrights of Great Britain and Ireland. He comes from a background of a lifetime working on microspecies of many kinds and having developed views on how to deal with the combinations of detailed differences between them. The Reay Eyebright (Euphrasia reayensis) was described as a species by Sell in 2009 having previously been referred to as a distinct variety with the Latin name Euphrasia brevipila var. reayensis. It is very similar to the Northern Eyebright shown in Fig 1 with similar showy large flowers and large leaves. However the middle and upper leaves bear long glandular hairs (i.e. tiny spherical objects are borne on hair-like stalks about 10 times as long as the diameter of the gland). The stem length between leaves is small so that the leaves overlap like slates on a roof. It is best seen on Reay golf course and around the church where it is plentiful. It is recorded from a few other places along the north coast but, being a newly described species, its distribution is not yet well defined. It is not known from anywhere else in the world. The Northern Eyebright (Euphrasia borealis) is shown in Fig 1. It is 4 to 6 inches tall with a few branches. The flowers are large and the leaves are large with crisp white hairs. It is the most common eyebright in the area being found in grassy places. The Island Eyebright (Euphrasia arctica) is similar to the Northern Eyebright but the flowers are larger. It is known from marshy ground in Orkney and Shetland, but I include it here because it has been recorded from the Bettyhill area and may be present there though I have never found it. The Common Eyebright (Euphrasia nemorosa) is not very common in our area but it can be found in grassy and heathy places. Again it has similarities to the Northern Eyebright but has smaller flowers and much of the stem length is greater than the leaf length so the leaves do not look crowded or overlapping. The Branched Eyebright (Euphrasia confusa) is best recognised by its many branches from the base of the stem which grow upright producing mid-size flowers. It is widespread through several habitats but not plentiful. The Alpine Eyebright (Euphrasia frigida) is an alpine species to be found on mountains and in a few places on exposed cliffs. It is a single stem usually 1 or2 inches high with smallish flowers and a distinct leaf shape. The Seaside Eyebright (Euphrasia foulaensis) is common on seashores. Among the taller plants of a sheltered seashore it is an upright plant with small violet flowers spread along the stem. 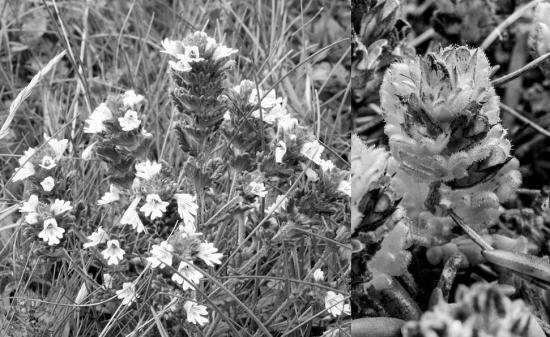 But in an exposed clifftop situation it is only one inch high and the leaves and flowers are crowded together, The sparse, short, crisped white hairs on the leaves then become an identifier when comparing it to Marshall's Eyebright or Ostenfeld's Eyebright. Ostenfeld's Eyebright (Euphrasia ostenfeldii) is a widespread but scarce seashore eyebright but there are a few records of its occurrence in the north-west. It has fleshy leaves infused with purple and covered with long hairs. The flowers are mid-sized and white or violet. Marshall's Eyebright (Euphrasia marshallii). This seashore eyebright is another rarity of the north and is protected under Schedule 8 of the Wildlife and Countryside Act. It lives at the top of low cliffs where the sea spray is intense and the wind exposure is fierce. It is shown in Fig 2.It has a short stem, overlapping hairy fleshy leaves and small white flowers. It occurs along the north coast, a little on the east coast and around Orkney and Shetland - but nowhere else in the world. It is named after the Reverend Edward Shearburn Marshall who discovered it and the Round-leaved Eyebright both in the vicinity of Melvich while on a botanical tour of the north coast in 1895. The Round-leaved Eyebright (Euphrasia rotundifolia) is another north coast seashore rarity and has been rather misunderstood and mis-recorded. I think it is now clear that its only occurrence in the world is on the cliffs around the Geodh Glas at Portskerra where it is plentiful. It is typically an inch high with round leaves and small flowers. The Purple-stemmed Eyebright (Euphrasia micrantha) is a frequently found plant among heather. It mimics the heather by being the same height, having a similar general habit and producing small purple flowers at the same time as the heather. Its stems are upright and slender and infused with purple. It occurs widely with heather around the world. The Scottish Eyebright (Euphrasia scottica) occurs in the same habitat as the Purple-stemmed Eyebright and often grows with it. It is less infused with purple and the stems are less branched and it has the distinguishing feature that the leaves are usually purple above and green below. It is very common in Scotland. Heslop-Harrison's Eyebright (Euphrasia heslop-harrisonii) is another northern rarity. The plant was named by Peter Yeo from material sent to him by a worthy Orkney botanist, the late Elaine Bullard. It came from the isle of Swona where it grows in quantity and hybridises with the Northern Eyebright. Subsequently a few other sites have been found on other Orkney isles, the Isle of Rhum and Shetland and, given the similar habitats in Caithness one hopes to find it there someday. It grows in short clifftop turf, is one inch high with slender stems and small flowers. It has a characteristic leaf shape which distinguishes it. Yeo, P.F. A taxanomic revision of Euphrasia in Europe. Botanical Journal of the Linnean Society 77: 223-334. 1978.